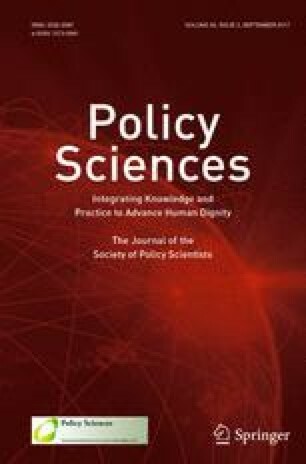 An earlier version of this paper was presented at the International Workshop on Designing Governance for Policy Effectiveness, Lee Kuan Yew School of Public Policy, National University of Singapore 25–26 February 2016. I would like to thank the workshop participants and the anonymous reviewers for very insightful comments. Bernanke, B. (2014b). The federal reserve: Looking back, looking forward. http://www.federalreserve.gov/newsevents/speech/bernanke20140103ahtm. Accessed 5 July 2016. Committee on Climate Change. (2014). Managing climate risks to well-being and the economy Adaptation Sub-Committee; Progress Report 2014. London: Committee on Climate Change. http://www.theccc.org.uk/wp-content/uploads/2014/07/Final_ASC-2014_web-version-4.pdf. Accessed 5 July 2016. Federal Open Market Committee (FOMC). (2008). Meeting of the Federal Open Market Committee on October 28–29, Washington, DC. http://www.federalreserve.gov/monetarypolicy/fomcminutes20081029.htm. Nahmias, R. (2008). Israel warns Hizbullah war would invite destruction. Ynet News. http://www.ynetnews.com/articles/0,7340,L-3604893,00.html. Accessed 5 July 2016. World Health Organization. (2003). Update 11—WHO recommends new measures to prevent travel-related spread of SARS. Mar 27. http://www.who.int/csr/sars/archive/2003_03_27/en/. Accessed 7 July 2016. World Health Organization. (2014). Ebola response roadmap. Geneva. http://www.who.int/csr/resources/publications/ebola/response-roadmap/en/. Accessed 30 May 2016. World Health Organization. (2015). WHO publishes list of top emerging diseases likely to cause major epidemics. WHO Updates. http://www.who.int/medicines/ebola-treatment/WHO-list-of-top-emerging-diseases/en/. Accessed 5 July 2016. Yadlin, A. (2015). How Israel created deterrence in the Second Lebanon War. Ynet, May 22. http://www.ynetnews.com/articles/0,7340,L-4660200,00.html. Accessed 5 July 2016.